An event series exploring the profound and sometimes funny intersection of science and art through the lens of film. Science and science fiction have always been deep wells for the imaginations of filmmakers, all while science and technology have advanced the quality of filmmaking. 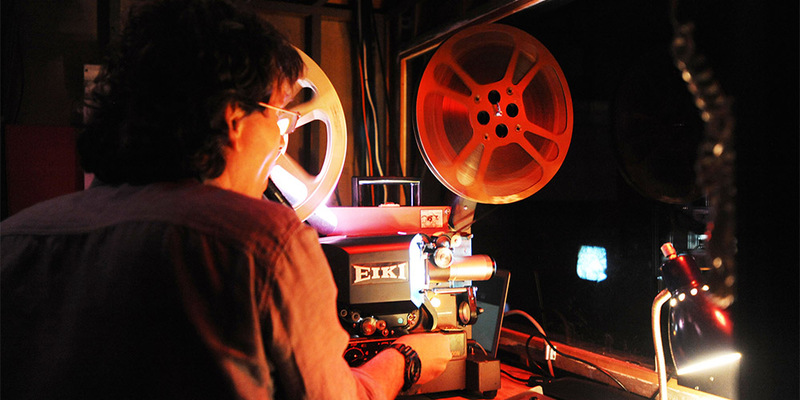 The Knight Foundation-funded Science Art Cinema series blends film and science by showing 20th century science and science fiction films and pairing them with live music, theater, guest speakers, and multimedia presentations. Past iterations of the series included presentations on lasers, and filmmaker Stan Brakhage’s innovative use of the science of light and chemistry. The final event of the first series will be a film festival in the Frost Planetarium on August 31, 2017. The program is curated by Obsolete Media Miami’s Barron Sherer and Frost Science’s Kevin Arrow and Dr. Jorge Perez-Gallego. On Saturday, August 29, 2015, Frost Science hosted Science Art Cinema #1: Lasers. The event focuses on lasers and their many uses, from medical technology, to holograms and light shows, including a series of films about the early days of lasers, introduced by San Francisco-based film archivist, Steven Parr of Oddball Films. After the films, guests made their way into the museum’s Planetarium to experience the immersive laser sculpture and soundscape by artist Matthew Schreiber. Schrieber’s laser installation was enhanced by a live music performance conducted by Cody Boyce, featuring well-known local guitarists, including Autumn Casey of Snakehole, Rick Fantasies, Gavin Perry and Beatriz Montevaro of Holly Hunt, Julie Ghoulie of Crud and Frank “RatBastard” Falestra of Laundry Room Squelchers. Attendees enjoyed cocktails by Tito’s Vodka, refreshments by Perrier Sparkling Natural Mineral Water, and beer courtesy of Wynwood Brewing Company. On Friday, October 23, 2015, Frost Science held its second Science Art Cinema at the de la Cruz Collection in the Miami Design District. Art aficionados and science enthusiasts were invited to experience Science Art Cinema #2: Fear, an evening that featured a 16mm screening of the science fiction cult classic, “Queen of Blood,” which was enhanced by an intriguing presentation on the psychology of fear by Dr. Elizabeth Reynolds Losin from the University of Miami’s Department of Psychology. Guests also enjoyed a special set by DJ Le Spam, along with complimentary light bites and libations provided by the de la Cruz Collection. Attendees included Carlos and Rosa de la Cruz, Ibett Yanez, Director of the de la Cruz Collection, and Dr. Eldredge “Biff” Bermingham, Chief Science Officer at Frost Science. On Thursday, May 5, 2016, Frost Science hosted Science Art Cinema #3: Experiment at the home of our Museum Park neighbor, Pérez Art Museum Miami. The evening’s special program featured a series of short experimental films by one of the most significant figures of 20th century avant-garde cinema, Stan Brakhage, including “I…Dreaming,” “Marilyn’s Window,” “Babylon Series,” “Agnus Dei Kider Synapse,” “Naughts,” and “Boulder Blues and Pearls and….” Science Art Cinema 3: Experiment was be complemented by an introduction to experimental cinema by Dr. Tony Allegro, professor at the University of Miami’s School of Communication, who will discuss the artistry of Stan Brakhage and his innovative use of the science of light and chemistry. Composer and artist, Gustavo Matamoros enriched the programming with musical entr’actes inspired by the rhythms and motion prominent in Brakhage’s work. On Thursday, August 31, 2017, Frost Science hosted the sold-out Science Art Cinema Film Festival in the Frost Planetarium. Guests enjoyed entertainment from Buffalo Brown, along with activations by the Miami Film Festival, FilmGate Miami and the Lynn and Louis Wolfson II Florida Moving Image Archives at Miami Dade College. The program began with an introduction by fellow judges Dr. Jorge Perez-Gallego and Kevin Arrow of Frost Science, followed by remarks from Andrew Sherry, Vice President of Communications at the John S. and James L. Knight Foundation. The evening also featured a surprise video message from Christian Slater, who was on the set of the television series “Mr. Robot.” After a screening of all the film finalists, the winners were announced. First place was awarded to “Metamorphosis of Plants” by Urszula Zajaczkowska; second place was awarded to “Space James” by Michael Ruiz-Unger; and third place was awarded to “Diviner Intervention” by Emily Cussins.